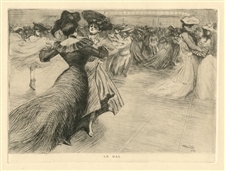 Tony Minartz original etching "Le Bal"
Medium: original etching. A good impression on wove paper, published in Paris in 1902 for the Revue de l'art ancien et moderne. Plate size: 5 3/4 x 7 7/8 inches (147 x 200 mm). Signed in the plate by Tony Minartz; not hand-signed.